A footballer who made a homophobic gesture to Brighton and Hove Albion supporters has been found guilty. Colin Kazim-Richards mimicked pulling his shorts down and put his left arm behind his bottom at the match last February, Brighton magistrates heard. 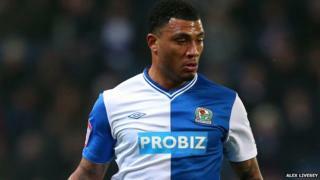 Kazim-Richards, 27, who was playing for Blackburn Rovers at the time, claimed he was "having a bit of banter" with fans who he said were abusing him. But he was convicted of using abusive or insulting behaviour and fined £750. Sussex Police said it was the first conviction of its type involving allegations of homophobia against a professional footballer. Kazim-Richards committed the offence while playing on loan for Blackburn against Brighton, his former club, in a Championship match on 12 February 2013. The court heard he was targeted by fans with the chant "you're fat and you know you are". The player told magistrates he had been prepared for the banter and said he had been "interacting with the fans" when he made the gesture behind his back. "I was basically doing what they were doing to me," said the footballer, who now plays in Turkey for Bursaspor. Christopher Cannon and his son Daryl, who were working as match-day press stewards, told the court they saw Kazim-Richards make the gesture more than once and they had found it offensive and homophobic. Daryl Cannon said: "I perceived it as a very wrong thing to do, particularly for someone who's involved with the Kick It Out Campaign. "Racism and homophobia are on the same level." PC Darren Balkham, Sussex Police's football liaison officer for Brighton and Hove Albion, said after the hearing: "The Brighton fans have been subjected to a lot of homophobic abuse over many years. "This was somewhat of a test case involving a professional footballer. "We are where racism was 20 years ago," he said. "This was the first case where a professional footballer has been convicted of making a homophobic gesture towards the crowd." In 2013 the Crown Prosecution Service (CPS) said "positive action" would be taken when behaviour in football was regarded as offensive. Kazim-Richards, who had denied using threatening, abusive or insulting behaviour likely to cause harassment, alarm or distress, was also ordered to pay £620 court costs and a £75 victim surcharge. Video Football v Homophobia campaign: Is enough being done?